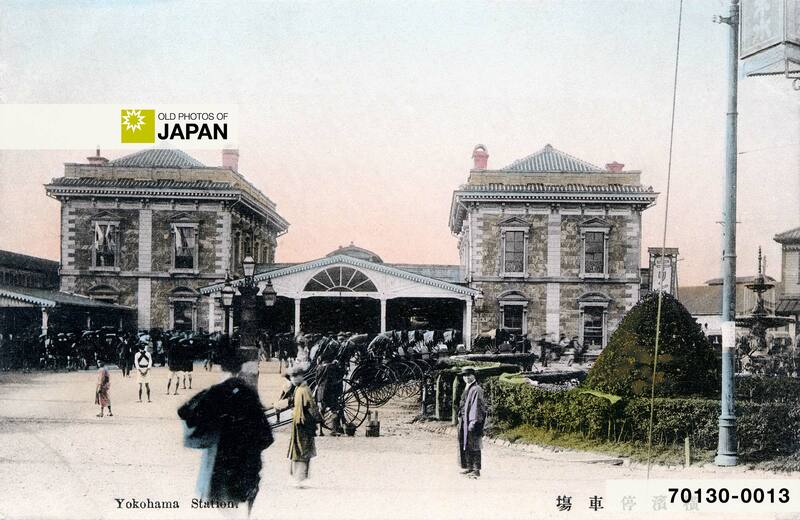 Yokohama Station was a terminal station on Japan’s very first railroad, opened on June 12, 1872 (Meiji 5). The line took passengers and freight to Shinagawa. In October it was extended to Shinbashi, connecting the port city to the very center of Tokyo. The new railroad reduced traveling time between the cities significantly. On foot it took between 10 and 12 hours. Even at the trot, a horse took 4 hours. The train took only 53 minutes. It greatly contributed to the prosperity of Yokohama, especially that of nearby Noge. Yokohama station was designed by American architect Richard P. Bridgens (ブリジェンス) who in 1864 (Genji 1) had come to Japan from San Francisco. Active as an architect in Yokohama and Tokyo, Bridgens’ influence on western architecture in the two cities cannot be overstated. Besides Yokohama Station and its twin, Shinbashi Station, he designed many other buildings that played important roles during the Meiji Period. Especially eye-catching was undoubtedly the Tsukiji Hoterukan (築地ホテル館, Tokyo, 1868-1872), a building with a unique mix of Western and Japanese architecture. Other well-known Bridgens designs are the Yokohama Customs House (横浜税関, 1873-1910? 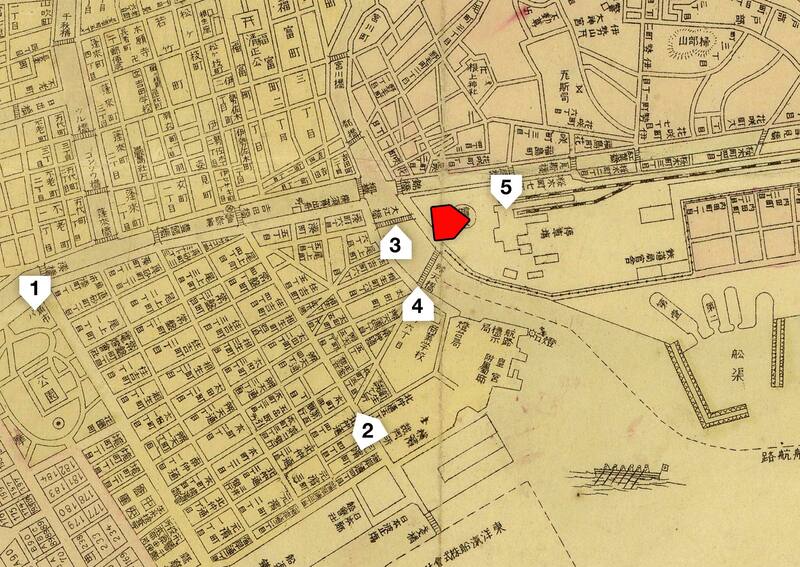 ), an attractive three-storied brick building near the harbor, and the Yokohama Town Meeting Hall (横浜町会所, 1874-1906). He is also believed to have built the original Yokohama Grand Hotel. Bridgens died in 1891 (Meiji 24). His grave can still be found at the Yokohama Foreign General Cemetery (横浜外国人墓地). A strange sight has been witnessed recently in Japan. A railroad has been completed between Yokohama and Yeddo, and the Mikado opened the line while the band of a French corvette, the Belliqueuse, enlivened the scene by playing “Voici le Sabre de mon Père.”1 The fantastic jumble of the gravity of the Orient and the burlesque of the Occident, the mingling of the prosaic and scientific spirit of a utilitarian age with the dreamy pomp and barbaric magnificence of an age of romance, must have not been a little curious, and the various surroundings tended to make it still more so. It appears that deputations and officials were present from all the foreign maritime Powers, and, of course, these personages wore grand dresses and uniforms. The military which escorted the Mikado wore their native costumes—distinguished for the occasion by uncommon splendor—while the Mikado himself wore a plain, snow-white tunic, with a mantle of yellow silk. Fair readers will be interested in knowing that this progressive monarch is a handsome man, with regular features, and skin of a pale olive; also, that he wore a chignon, formed of the back hair brought to the top of the head, and surmounted by a small silk cap. The Ministers of State were attired in robes of green, violet, and rose-colored crape; the officers of the army and navy wore quantities of gold lace, and the various hangings and banners were gorgeous with many-hued embroideries and flashing with jewels. When the State carriage of the Mikado arrived, a long carpet of luxurious texture was laid from the door to that of the palace car on the train. Along this the first gentleman of Japan moved with dignified deliberation, followed by his staff and a bevy of beautiful ladies of the Court. Amid the booming of cannon and the rolling of drums, the “huzzas” of the Americans and Europeans, and the loyal cheers of the natives, the first steam locomotive that ever drew a train in Japan moved slowly toward Yokohama, and the fresh link forged by science to draw together the West and the East was thus firmly connected. There have been few sights in the time of this generation more suggestive. Ukiyoe (woodblock print) of yokohama Station. The new Japanese railroad unites the first seaport of the Empire with its capital, and is, in French measure, some thirty kilometres in length. 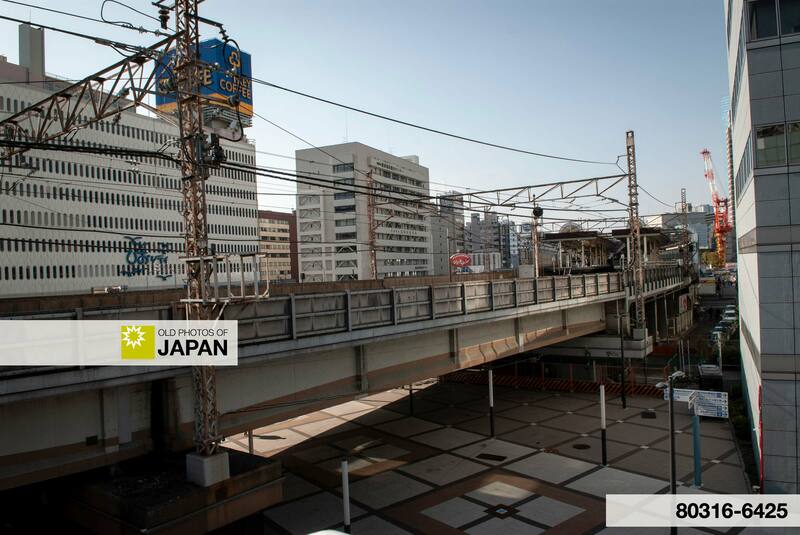 It has been built at the expense of the Japanese Government, but under the direction of English engineers. It has cost eleven millions of francs, or two hundred and twenty thousand dollars a mile, which is regarded as an enormous sum, but which, considering the line to be the first ever built in the country, does not seem to be excessive. The road is to be continued to Osaka, and we shall doubtless soon hear of extensions in other directions. Soon, too, we shall probably be told of speculations in the stock, of “Bull” and “Bear” combinations to put it up and down, and of native “operators” distinguishing themselves like the famous, and infamous, magnates of Wall-street. That railroads will be greatly encouraged in Japan seems certain, for very good reasons. In the first place, the present road is sure to be enormously profitable. By it, in half an hour, the Yokohama merchant can send his goods to Yeddo. The ease with which the rich products of the Japanese Islands can find a market by being sent to the sea-shore will be consequently illustrated in a forcible manner, and the advantages thus likely to accrue to our own Pacific trade are not less obvious. A market for American productions will undoubtedly be created, and a system of exchanges begun that will, in no distant future, increase in a great degree our national wealth. The article is remarkable in that it carefully recreates the opening event, but also for its optimism and hope for the future. Notable is that the correspondent still uses Yeddo (Edo) to describe Tokyo, a word that had been out of use in Japan since 1868 (Meiji 1) when the city was renamed to Tokyo (literally “Eastern Capital”). It was stubbornly used by foreign publications well into the 20th century. There is one more thing that attracts attention. His description of the train as “the first steam locomotive that ever drew a train in Japan.” This must have been born either out of sheer excitement or have been journalistic license; at the time of the official opening, trains had been running on the track for over four months. 1 “Voici le Sabre de mon Père” (music download) is from the opera “La grande duchesse de gérolstein” by Jacques Offenbach (1819-1880). You can also licence this image online: 70130-0013 @ MeijiShowa.com.